Expands – Completely fills irregularly shaped cavities. Adheres – Solidly integrates with surrounding wood. Hardens – Cures to the strength of wood poles. Gaffable – Will hold climbing gaffs. Quick Mixing – Two-part formula mixes in nozzle when applied. Polywater® UPR™ Utility Pole Repair makes it easy to repair woodpecker damage and pole line hardware holes on utility poles. The two-part formula is mixed quickly and injected into the hole through the 8” mixing nozzle. Partially used cartridges can be resealed and reused with a new nozzle. The UPR™ Pole Repair resin and hardener were specially formulated to expand in the pole cavity rather than to just fill. Because UPR™ Pole Repair expands in the hole, it easily fills irregularly shaped cavities for solid integration with the wood. This creates superior adhesion to the wood grain compared to non-expanding products. UPR™ Pole Repair hardens just like wood so it is gaffable and will not chip out when climbers’ hooks are used. UPR can be used to repair Penta treated wood, Western Red Cedar, Douglas Fir, Red Pine, Southern Yellow Pine, Lodgepole Pine poles and other varieties of wood! UPR™ Pole Repair comes in two types. The "PR" version is a liquid formula that flows around wood block fillers to save material. The "NF" is a quick-gelling version that will not leak or drip out of wood cracks at the bottom of the hole. 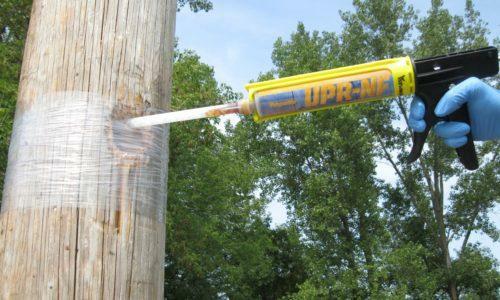 To fix one “football-sized" hole on a pole, order the UPR-PRKIT3 or UPR-NFKIT4. For multiple holes, transmission line jobs, or volume pricing, order the UPR-PR(NF)KIT12. UPR™ can be dispensed with a standard high-ratio caulking gun.